The secret perfect recipe for a successful first date is to find a trendy spot with a nice crowd and elegant yet friendly atmosphere. The place cannot be too loud or too crowded, but you do not want to be alone in an empty space either. Dim lighting is required and plush and comfortable leather or velvet seats, preferably red to set the mood right. There must be a nice selection of cocktails, wines and small plates to share, to help create the intimacy. Well, do not look any further, Geneva’s Manhattan Café has got you covered. They have all this and more. It is cozy, warm and stylish. The service is excellent. The setting is perfect for a romantic dinner or for a few drinks and nibbles if you are not fully convinced by your date. They are opened for lunch, but the main event is certainly the afterwork ambiance and dinner. I tried their winter hot dog with pan-fried foie gras and fig jam (26CHF) — it was a great success. 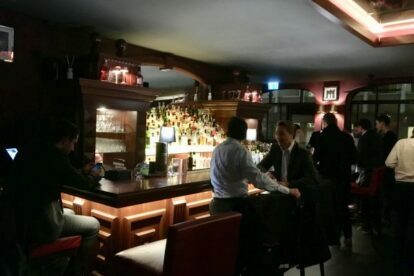 Being a New York-inspired bar and restaurant, their menu also offered some classic American dishes such as spare ribs with homemade barbecue sauce (28CHF). If you really want to impress your partner and you are both meat lovers, I suggest ordering their tomahawk, which is 1.1 kilo of Angus prime beef rib (115 CHF for 2 persons). The best way to end this delicious evening would be, of course, to split a Manhattan cheese cake vanilla and speculoos (12CHF).